Launching your iOS app is exciting. What is even more exciting, is understanding how to monetize your app and turn your iOS app into a source of revenue. It can be quickly done by mobile app marketing and incorporating advertisements into your apps. However, there are a lot of different methods of achieving this, and some are more successful than others. Learn how to promote an app & how to monetize an app effectively by using simple concepts of app marketing. This app marketing course goes over the primary tools you will need to start profiting from the app you have created. This course will focus on platforms, such as Revmob, Chartboost, and AdMob. At the end of the course, you will know how to incorporate these tools into your new iOS apps, or how to upgrade your existing apps for them to be compatible with those tools. You’ll be able to decide what kind of app marketing strategy works best for you then implement it instantly and as a result, start earning extra money. The app marketing course consists of 7 sections, 6 of which are individually focused on adding the tools as mentioned earlier into your apps. Chapter 7 will give you general knowledge on how to set up in-app purchases correctly, register you apps with Apple, create professional icons for the apps, and more. This app marketing tutorial will explain how to monetize an app as well as how to promote an app. In order to actually earn from ads in your app, you need people to be interested in your application in general. This course will talk a little bit about that too. Therefore, you won’t need to look for information anywhere else. This mobile app marketing tutorial will explain everything in a step-by-step manner. You’ll learn how to download the latest Software Development Kit (SDK), add framework files and other dependencies, fix common errors as well as how to initiate the tools using simple coding. You’ll start with Charboost. It’s trusted by over 300 thousand games worldwide. Charboost provides you total control of your campaigns as well as adds tailored to your apps. Next, you’ll move on to Revmob. It’s one of the leading mobile ad networks in the World. Created by Ant Smasher developers, Revmob is focused on helping publishers monetize their apps easily. It works on different platforms like Google Play, App Store, Amazon, Samsung Apps and more. Last, but not least, you’ll learn how to utilize Admob. Over 1 million apps, as well as Google advertisers, are using Admob. It gets over 200 billion ad requests every month! You can use Admob on iOS, Android, Unity, and Cocos2D-X apps. Your teacher for this tutorial is Yohann Taieb. Yohann is an experienced programming college tutor. He’s also an author of many development and marketing tutorials that you can find on BitDegree. 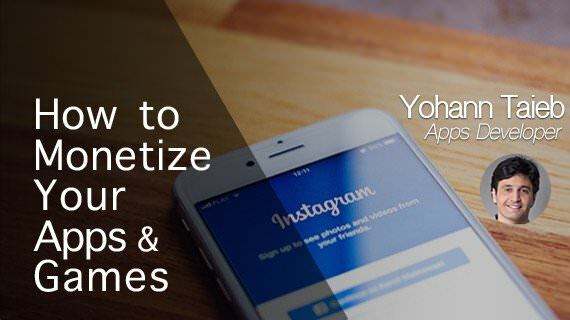 Yohann’s areas of expertise are iOS, iPhone Development, Android, Adobe Photoshop, Apple Watch development, Swift 3, Unity 3D, and Pixel Art. He has worked as a developer for years too. So, you can be sure that you’re learning about mobile applications from a real expert. This course is split into short and fun video lessons. Therefore the information will not confuse you. This tutorial is suitable for a complete newbie as well as an intermediate mobile developer. Yohann explains every aspect of app marketing in depth while using examples and simple everyday language. So, you’ll be able to successfully finish this course and learn something useful regardless your previous background. Another cool feature of this course is that it only takes a few hours to complete. So, you won’t be wasting any time. If you have created apps before and are looking to profit from your work, this is a great starter course to get you into the world of the app store. Create your app marketing strategy and understand how to promote your app today! Start learning now!